Yes, that’s my family on the cover—all ten of us! We had to get creative to include two of our sons who were out of the state and country. I thought it was rather a genius idea, from my eldest daughter, to blow up their photos so they wouldn’t be left out of my home cooking cookbook. That’s how our family rolls: creative, spontaneous, and make-it-happen. In fact, that’s how my recipes in this cookbook came about! As I was preparing meals at home, I might find that I was missing an ingredient to a recipe, wanted to improve one I’d tried, or was inspired by something I found on sale at the market. I think it was the artistic side of me that I’d not expressed since art school that found another outlet through my cooking. As our family continued to grow through adoption, it was up to me to stretch the dollars and fill the stomachs. That meant fresh food made at home. No drive-thrus for this family! 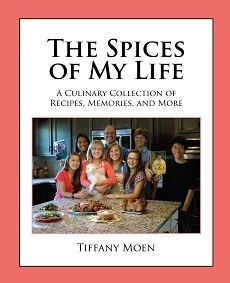 So come along with me and cruise through these recipes, memories, and more. I think you’ll discover what my family and friends have enjoyed for years: delicious food, happy palates, and the wish that you had enough for leftovers!